Positioning puts in the hands of the brand manager an entire array of differentiating strategies. He must judge which of these strategies can help him locate a niche in the market where his target segment will perceive his brand as unique and where it will hold a competitive advantage. It can be challenging to determine the right Brand Positioning. A variety of thoughts come to mind including different target segments, different frames of reference and many other options. The key is to hone into the right choice. Marketing concepts aren't difficult to grasp but can be challenging to implement. There are many ways you can fail in the marketing world and only a few ways to get it right. How your brand is defined to customers is one of those absolutely crucial marketing concepts. Review this PDF for more information on using mental maps. A statement that defines a brand in approximately 30–seconds is what we call brand mantra, or in other terms, an elevator speech. Thirty seconds worth of material sounds simple, but realistically the right brand mantra involves extensive analysis. Consider yourself fortunate if you can develop a brand mantra or elevator speech quickly, as this generally requires a careful and deliberate thought process. A brand mantra may be three words, but they must be precisely the right three words. Creating a brand requires you to do extensive market research in an attempt to determine what the customer is thinking. Questions you may consider include, how do they feel about the category, and how do they think about different brands? Determining the essence of the brand or the brand mantra requires developing a mental map. A mental map is a graphic depicting what makes up the brand. In addition, it is a thought association process. The essence of the brand emanates from the consumer's point of view, the different associations and how those associations lead to other associations. Some call this a mental map, yet others label it as schemas. A schema is a mental structure we use to organize and simplify our knowledge of the world around us. There are plenty of different techniques you can utilize when creating mental maps. The size of the circle can reflect how often different people name that association. Similarly, the lines that connect one circle to another circle can represent the strength of those associations. Primarily, you are developing something called a semantic associative network or a mental map. This involves developing a picture of the thought and associations that come up with the brand. These may be physical attributes, or lifestyle, or use occasion, or user image or the channels that carry it. 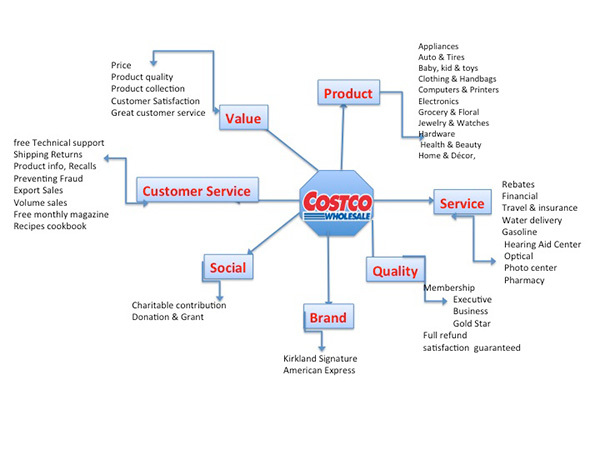 Costco — an American membership–only warehouse club that provides a wide selection of merchandise and services. There are a few different ways to develop your brand mental map. Begin with associating the closest ones to the core as the ones that come to 'top of mind' first. The ones that are further away will come up after time thinking. You are collecting all of the thought associations that come up when thinking of or interacting with the brand. Ideally, you will want to do this process with several customers, in market research stages, using several different methods. Ultimately take all the various abstract phrases and concepts that exist and define which are the most important five to ten. Begin with a mental map or the associations that people have with the brand or even the category and depending upon how well known the brand. You will need to narrow down that big mental map to the core brand values which are essential to that brand. From there you will want to reduce those five or ten to the fundamental concepts that are going to be the DNA of the brand, the brand mantra. The “mantra” concept serves to reinforce the role of the brand essence in internal communication. Kevin Keller who coined the term “brand mantra” explains it as follows: “It should define the category of business for the brand and set brand boundaries. It should also clarify what is unique about the brand. It should be memorable. As a result, it should be short, crisp and vivid in meaning. Ideally, the brand mantra would also stake out ground that is personally meaningful and relevant to as many employees as possible.” This concept reverts to that elevator speech again. Developing the brand mantra is crucial. Everything you do, including the new and enhanced products you create, as well as advertising have to fit within the brand essence. The customers and employees will become familiar with the brand mantra. Necessarily, a powerful brand requires a crystal clear statement of what that brand is and what it means. It is imperative to characterize everything that is done under the brand name including online, offline, and via phones. Your brand is imposed on lots of different things, and you must ensure that the heart and the soul of the brand are consistent across all media, platforms, and products. What is the essence of the brand mantra? It has three essential parts. One part is the brand function, and it represents the nature of the product or service, it describes the type of experiences or benefits that the brand provides. The second part is the descriptive modifier that further classifies or clarifies the nature of what the brand is delivering. The third part is the emotional qualifier that explains precisely what those benefits are. The brand mantra is used internally to guide decisions, and it includes what the brand should and shouldn't be. It is essential to understand that a brand mantra communicates what a brand is and what a brand isn't. Ideally, your brand mantra is black and white. For example, this is Nike. This is not Nike. This type of idea informs the boundaries of the brand. The brand mantra has to be short, simple and should be inspirational. One of the best brand mantras of all time, developed by Nike’s marketing guru Scott Bedbury in the late 1980s (he would later become Starbucks’ marketing guru). Bedbury coined the phrase brand mantra. It did everything you would want a brand mantra to do—it kept the Nike brand on track, it differentiated the brand from its main competitor at the time (Reebok), and it genuinely inspired Nike employees. BMW’s brand mantra is noteworthy in two ways. One, it reveals the power of a straddle branding strategy by combining two seemingly incompatible sets of attributes or benefits. When launched in North America, some cars offered either luxury or performance, but not both. Two, it is also a good example of how a brand mantra can be used as a slogan if its graphic nature is compelling enough as is. They have defined customer service as being Helpful, and in their hiring, training and customer interactions, they make it clear that Helpful is what they are all about. 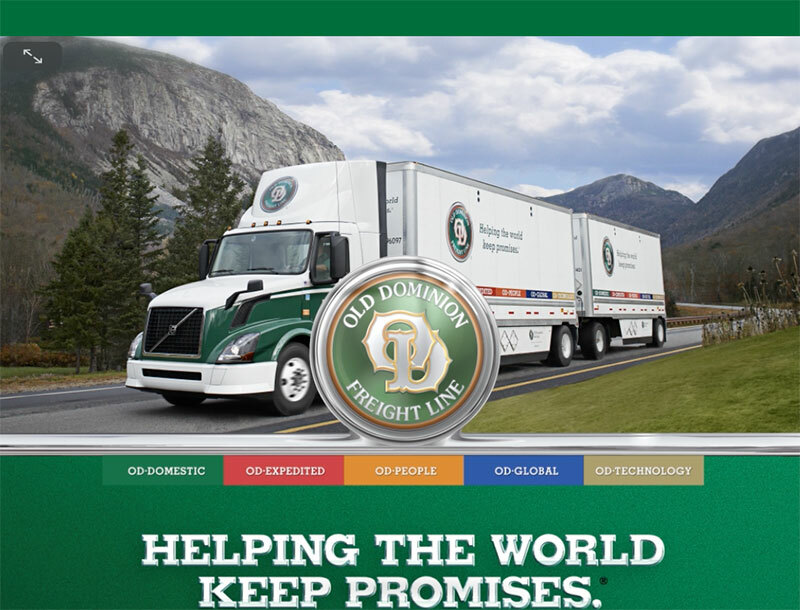 Spotted on the side of a semi: “Helping the World Keep Promises” The company - Old Dominion Freight Line. Google: To organize the world’s information and make it universally accessible and useful. Here is a short YouTube story showing Google's Mantra in use.